Tensions Escalate in Israel and Palestine. The Killing of 7 Palestinians, 400 Wounded. Violence spiralled in Israel and the occupied territories on Saturday, as protests rocked the West Bank and Gaza and several knife attacks were reported in Israel. The casualty list of Palestinians rose rapidly on the day, with at least two teens shot dead in Gaza, two protestors killed in East Jerusalem and two men who reportedly attacked Israelis shot dead. In total, the Palestinian health ministry has confirmed that seven Palestinians were killed by Israeli security forces. On the Israeli side, three civilians and two policemen were stabbed. The Red Crescent said that more than 400 Palestinians were injured on Saturday alone as protests hit parts of northern Israel and the West Bank. Ibrahim Awad, 27, from Bet Omar near Hebron, also died in hospital. He had been shot in the head on Thursday by Israeli soldiers. The situation had been tense for days, but several sources on the ground told Middle East Eye that Saturday marked a tipping point. “I have lived and worked in Jerusalem and know the city well. I can’t remember a similar atmosphere to this in almost 20 years,” a Palestinian citizen of Israel, who did not want to be named, told MEE. We feel like we are in a war zone. Shops are closed. The military is in every corner ready to shoot. Everyone here feel targeted by Israel. As night fell on Jerusalem’s Old City on Saturday, the streets were quiet and a heavy police presence was visible. Earlier in the day shoppers, residents, tourists and worshipers could be seen milling around. Overnight, bloody clashes took place at the Shoufat refugee camp in East Jerusalem. Three youths were injured, and one later died of his injuries. Israeli security forces said the 22-year-old had opened fire at police, but anger in the often-volatile neighbourhood simmered and at his funeral later on Saturday fresh clashes broke out. 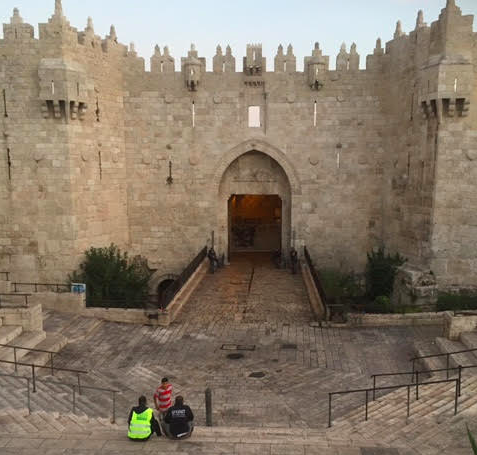 Later in the morning, Israeli authorities said that a 16-year-old Israeli had been moderately injured by an Israeli attacker who was later arrested closer to the Old City in Jerusalem. A few hours later, the streets close to the Old City saw fresh violence as a 16-year-old Palestinian stabbed two ultra-Orthodox elderly Israelis, who were lightly to moderately injured. The Palestinian teen Ishaq Badran, was quickly shot and killed by Israeli security personnel, but varying accounts of the incident soon began to emerge. A Palestinian witness at the scene told Middle East Eye on the condition of anonymity that he had heard Jewish Israelis shout racist slogans at Badran before he attacked them. “This is a vandal. This is a terrorist, kill him, kill him! '” the man said, imitating the settlers he heard. MEE contributor Faiz Abu Rmeleh, a photojournalist, was at the scene shortly after the attack. He said that police prevented Red Crescent ambulances from reaching the scene for nearly three hours, ensuring that Badran bled out on the ground. Abu Rmeleh claims that even after the attack, settlers gathered at the scene and tried to encourage the police to arrest or shoot Palestinians passing by. Abu Rmeleh was among several members of the press hurt in Saturday’s violence. He was chased and pushed to the ground by Israeli security forces for trying to cover the stabbing, with a fellow journalist capturing the scene on film. Another Palestinian journalist was reportedly shot in Shoufat in East Jerusalem and a third, Essam al-Reemawi, was shot with a rubber bullet near Ramallah as he covered the protests. As the afternoon wore on, a fresh knife attack rocked East Jerusalem, very close to Damascus Gate, one of the main entrances to the city. A Palestinian man seems to have charged at police officers. He then stabbed them before he was shot dead at the scene. Eyewitness accounts said that six shots were fired. One civilian was seriously injured when a stray bullet hit him. After this, the entrance to the old city was closed off, with panic spreading as residents feared a further police crackdown and wider restrictions on movement and travel. Residents claim that the police fired shots at anyone trying to approach. The Israeli authorities have vowed a tough response to any further attacks. Prime Minister Benjamin Netanyahu and Minister of Public Security Gilad Erdan approved the placement of hundreds of reserve army units in Jerusalem, Channel 2 reported. Jerusalem District Police Chief Moshe Adri also told reporters that his officers were “doing the job in the best way”. “As we expect from the police force, any one who stabs a Jew or an innocent person we want to kill [and] neutralise him,” he said. Meanwhile, several Israeli political parties – from both left and right – have called for Netanyahu’s resignation. According to the Jerusalem Post, the secular party Meretz called for his resignation during a protest in front of his official residence in Jerusalem. Party chairwoman Zehava Gal-On urged the prime minister to negotiate with the Palestinians instead of “managing the conflict”. “Whoever doesn’t recognize this threat and continues to play the victim, finding excuses for refusing [to negotiate] and blabbering about Iran, and bribing his friends with natural gas or a casino in Eilat, is a failed prime minister who is not worthy of being prime minister and has to go home,” she said at a Meretz demonstration near the Prime Minister’s Office in Jerusalem. “The whole country is on fire, and instead of voicing hope and calm, what we hear are messages of hatred, incitement and racism from rabbis, from organizations that already committed hate crimes in the past and from right-wing politicians,” she added. Kinesset member (MK) Yoel Hasson of the conservative Zionist Union said that many leaders said that Netanyahu did not know how to fight “against terrorism”. “For six years, Netanyahu has been prime minister and didn’t do anything to create a diplomatic horizon. For six years he abandoned the Palestinian arena and the result is dozens of terrorist attacks in recent days. Netanyahu is not using a strong enough hand against terrorism and isn’t presenting a diplomatic horizon. Today, the nation knows Netanyahu is not a leader,” Hasson stated. In contrast, MK Eitan Broshi, also of the Zionist Union, said he backs the policies of the prime minister. Tensions in the Old City, where many analysts and commentators believe the latest bout of violence originated over a growing number of Israelis entering the al-Aqsa compound, have also continued to escalate. Bethlehem, Ramallah and Hebron all saw clashes break out between mainly young Palestinian protestors and Israeli police. Hundreds were injured, mainly by tear gas, the Red Crescent said. Large-scale protests have also gripped the northern Israeli town of Nazareth, where more than 1,500 people took to the streets in a largely peaceful protest to denounce what they say claim as a heavy-handed respose by the Israeli police. On Friday, a 30-year-old woman from Nazareth was shot dead by Israeli police in Afula. The authorities claim that she was trying to stab people but the woman appears to have been unarmed and had no previous political connections. Protests that were due to happen on Thursday in the city never materialised after police blocked the streets and allegedly prevented buses from other Palestinian towns and villages from reaching the town. Protests took place in several different Arab villages and cities inside Israel. Locals told MEE that the police stormed into several houses and arrested at least 27 youths, according to Arab 48. Protests were also staged in Nazareth, Um Alfahem, and Tamra. Kholud abu Ahmed, a student and activist from Nazareth told MEE that she never witnessed such a situation in her city before. She added that hundreds of Israeli police in an east neighborhood of Nazareth had tried to stop the protests by shooting at the demonstrators. 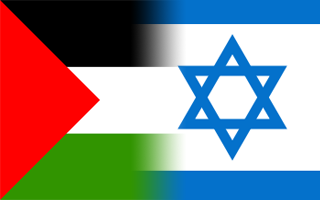 Palestinian authorities have urged Palestinians to not participate in any violence. Adnan Dmiri, spokesperson for Palestinian Authority security forces, told MEE that he was doing everything “to stop an armed Intifada”. “We tried that before and we paid dearly for it,” he said. “At the same time we are with the people’s vision for what they are doing by protesting against Israel’s violations at the al-Aqsa Mosque”. The youth, however, have on the whole taken a more confrontational tone. One young protester said he had been attending the protests until Israel, which has controlled the West Bank since 1967 withdrew and stopped allowing Israelis to entre the highly contentious al-Aqsa compound, known as Temple Mound to Jews. 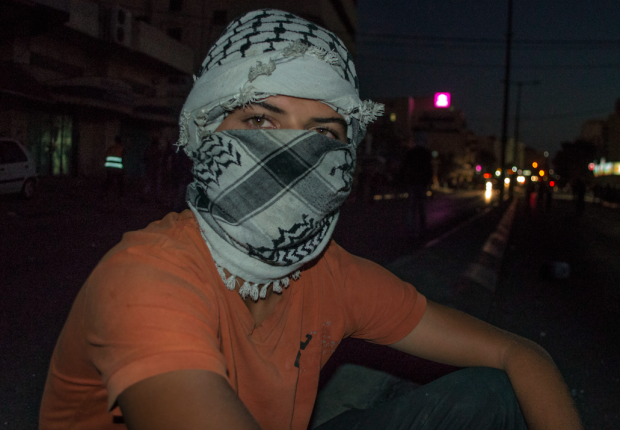 “The protests in Bethlehem and all over Palestine will keep happening everyday and I will keep coming out to protest tomorrow and the next day and the day after that – I don’t see things calming down at all,” a young protestor from Bethlehem, who did not want to give his name for security reasons, told MEE. Gaza, however, has seen some of the worst violence, with two teenagers shot and 10 people wounded by Israeli fire during clashes on Saturday at the Gaza border fence, emergency medical services in the coastal enclave said. Marwan Barbakh, 13, and Khalil Othman, 15, were killed east of Khan Yunis camp in southern Gaza. The Israeli army said they were killed during a “violent riot” in the southern Strip, “Palestinians entered the perimeter along the security fence, approached the fence, hauled rocks and rolled burning tyres at it”. Soldiers fired warning shots in the air, but when that failed to stop the Palestinians, “they fired toward main instigators”, a spokesperson said. The deaths come a day after similar clashes killed seven Palestinians and wounded 145. These clashes mark the bloodiest fighting in the territory since the summer 2014 War with Israel.